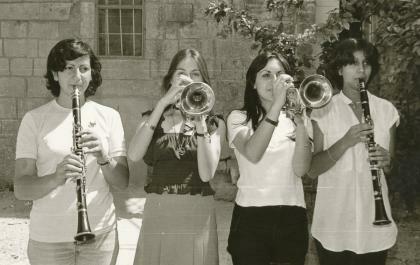 I studied at Birzeit College between 1968 and 1970. In 1968, there were about 168 students total (freshmen and sophomores, arts and sciences), and in 1969, about 196. So it was like an extended family, and in fact it was the first setup when we could experience the multiplicity of Palestinians in terms of geography and class. We had students from Gaza and Nablus, it was a coeducational school, which added to the flavor of the place, and it focused on lots of cultural activities. Gabi Baramki and Tania Nasir organized the production of Gilbert and Sullivan musicals like “Trial by Jury” and “Pirates of Penzance”. The elders of Birzeit had a pan-Arab, pluralistic outlook. It had integrity. As an Armenian, I never felt that I was distant, that I didn’t belong. Their Arabism was never exclusivist. We used to have an annual carnival with cultural and sports activities, and that gave a sense of belonging. During the time of the late Musa Nasir, followed by Gabi Baramki, all of us used to gather once a week to discuss a theme or topic, usually ethical. I remember that the first political strike or activity ever in Birzeit took place in December 1968 or January 1969. There were thousands of political detainees, and people were protesting these detentions. In Birzeit we had a sit-in at the village mosque for five or six days. It ended when the mayors of Ramallah and Birzeit came and some sheikhs and perhaps the mufti led us out of the mosque, and we broke our fast.